In a homily on the feast of the Blessed Trinity at the National Marian Shrine in Knock, Archbishop Eamon Martin of Armagh recalled Pope Francis’ first apostolic exhortation “Evangelii Gaudium” (“The Joy of the Gospel”), which has often been described as the blueprint for his papacy. “Pastoral ministry in a missionary key seeks to abandon the complacent attitude that says: ‘We have always done it this way.’ It invites everyone to be bold and creative in the task of evangelization,” wrote Pope Francis, in a passage cited by Archbishop Martin on Sunday, May 27. Friday’s closely watched referendum – where over 66 percent of voters cast ballots in support of undoing the country’s legal protections for the unborn – has been widely viewed as the latest sign of the Catholic Church’s diminishing influence in the country. “Like many others who advocated a no vote in the referendum, I am deeply saddened that we appear to have obliterated the right to life of all unborn children from our constitution and that this country is now on the brink of legislating for a liberal abortion regime,” said the archbishop. “I am very concerned about the implications for society of interfering with the fundamental principle that the value of all human life is equal and that all human beings, born and unborn, have inherent worth and dignity,” he added. 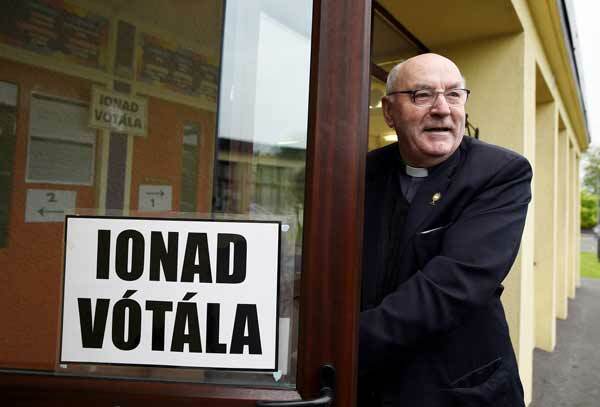 Yet despite his strong regret over the vote’s outcome, Archbishop Martin insisted now is not the time for Irish Catholics to become despondent. “This is our time for living. This is our time for believing. This is our time for mission and teaching the truth of the Gospel,” he said. He then urged those in attendance to continue to preach the sanctity of human life, using words from Pope Francis’ recent apostolic exhortation, “Gaudete et Exsultate” (“Rejoice and Be Glad” ), to punctuate his point. “Our defense of the innocent unborn … needs to be clear, firm and passionate, for at stake is the dignity of a human life, which is always sacred and demanding of love for each person, regardless of his or her stage of development,” said Archbishop Martin, again citing Pope Francis. The pontiff will visit Ireland in August for the World Meeting of Families, where the outcome of the referendum will likely loom large over the trip. During diaconate ordinations at St. Patrick’s College, Maynooth, Archbishop Diarmuid Martin of Dublin also drew heavily from Pope Francis, casting a vision of what it means to be “pro-life” that includes opposition to abortion, but extends beyond it. “The only way in which we can live as true disciples of Jesus is to respond to him in love and to create a climate of love wherever we may be,” said Archbishop Martin of Dublin on Sunday. “That loving care includes support to help those women who face enormous challenges and who grapple with very difficult decisions to choose life,” said Archbishop Martin. “Reshaping the Church of tomorrow must be marked by a radical rediscovery of its roots,” said Dublin’s Archbishop Martin.